Fight fire with fire! Noticeably reduce noise levels without destroying the natural look of your photographs. The newly developed Natural Grain Engine from DENOISE projects 2 employs a trick of physics: First, image noise is reduced to the furthest extent technically possible. The program then precisely inserts film grain into the image during the second step, rendering the photograph unbelievably realistic “ naturally realistic! 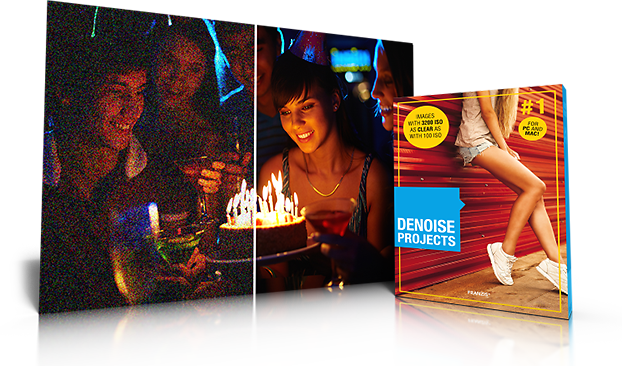 DENOISE projects 2 analyses your photos in a matter of seconds and presents you with dozens of image recommendations. Here theres no need to use the control panel or adjust any slide controls. You want to eliminate noise from your images as fast and stress-free as possible? Then DENOISE projects 2 is your program! Thanks to Smart Noise Prediction now 40% faster! Devoted followers and members of the Adobe Photoshop world need not forego impressive noise-reduced photographs. Simply install the integrated Filter Plugin for Photoshop or Lightroom and experience for yourself the new level of Denoise comfort when editing. DENOISE functions both as a standalone program as well as a plugin. Maximum flexibility, maximum performance!